Hello my dear readers, the familiar cliché, time flies doesn’t it? It’s time to say goodbye to 2009 and a big welcome to 2010! I wish this New Year would bring more joy, peace, happiness, wealth, and most importantly, health to everyone! Felt like just recently that we were all welcoming year 2000. I recalled everyone was so psyched with welcoming the new century then, but, was stressed out at the same time with fears the catastrophic Y2K or millennium bug was going to crash every computing system globally! Luckily nothing happened. :-) Fast forward 10 years, now we are closing out the first decade of this century! As for my new year resolution? Well, I stopped making them many years back. Told myself that I will just keep doing what I enjoy doing and try to do it better each year. Lame, I know, but it’s true. :-) Enough about me, I will look forward to hear some of your exciting 2010 New Year resolutions! A very Happy New Year greetings to all, cheers! 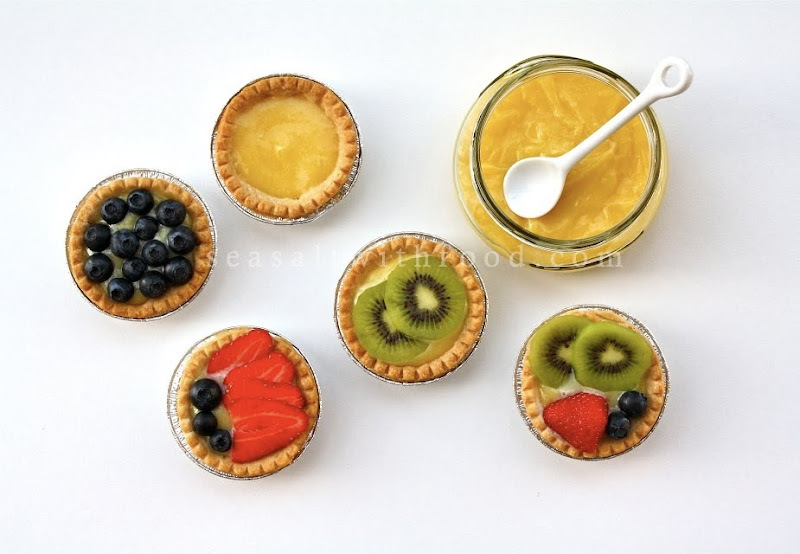 I made some Lemon Curd Tartlets with Fresh Fruits for dessert recently. This is one dessert my family truly enjoys, I think it must be the tartness. I used a combination of Kiwi fruits, blueberries, and strawberries. 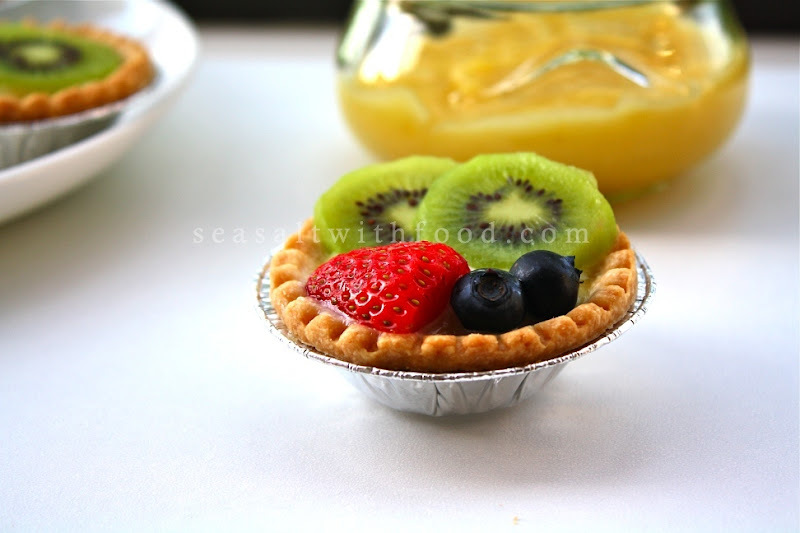 Interestingly, you should know that the Kiwi fruits I used for these tarts were grown locally here in Vancouver BC. My friend, John, grew these Kiwi fruits right on his front yard. They taste just as good, if not better, than those from New Zealand. John, you should be proud and thanks for the lovely Kiwi fruits again! Make the curd. Melt the butter in a metal bowl over a saucepan of barely simmering water. Whisk in the eggs. Add the sugar and whisk until thoroughly combined. Whisking continuously, gradually add the lemon juice and zest. Cook over the simmering water for about 20 minutes, stirring often, until thickened. Cool at room temperature. Preheat the oven to 375˚F. Bake the tart shells according to the package instructions. In a small saucepan, bring the jam to a boil, then lower the heat and keep stirring until melted and leave it to cool. When the shells are completely cooled, fill with lemon curd. Then top the lemon curd with fruits. Brush with melted jam, if using. Serve immediately. your photos are seriously so beautiful. Lately I've been finding myself just staring at them. Lovely! Lemon is the perfect flavor to welcome the new year: bright, sparkling and full of joy. Happy New Year! 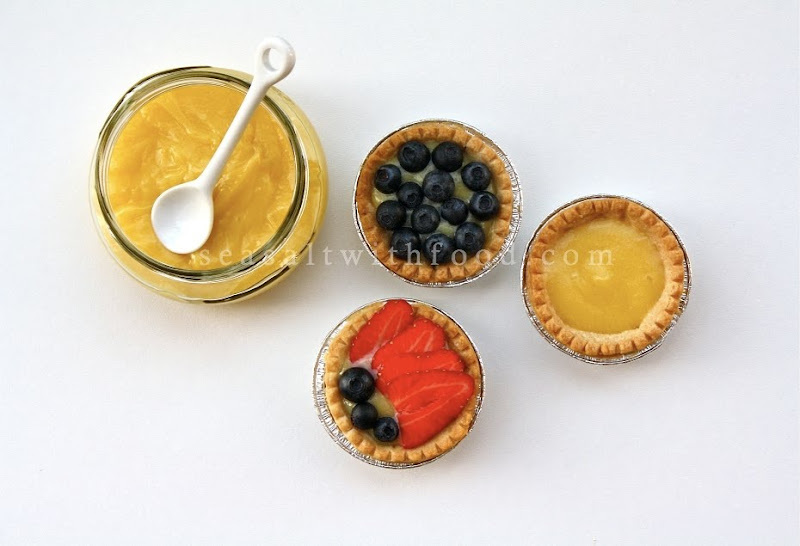 I had lost my lemon curd recipe, and was dreaming about it the other day. Serendipity for me that you post a new one today. Thanks, and you do post the most beautiful food shots, makes me ravenous just viewing them. 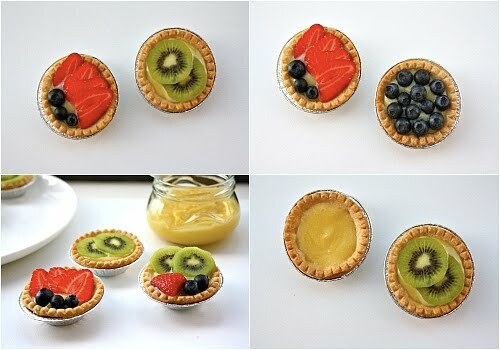 These tarts are lovely. I love lemon tarts. I must make these soon; they look refreshing. I love anything lemon, and these photos are amazing! I think I need to make these soon to bring a little bit of summer time to a Michigan winter.